Derives shaded relief raster maps (geo-coded hill shading) of DEM grids. Hill shading is a method to visualize a surface grid model by illuminating it using a light source shining from a certain direction. Artificial shadows are calculated depending on the slope (steepness) and exposition of the surface w.r.t the direction of the light source. 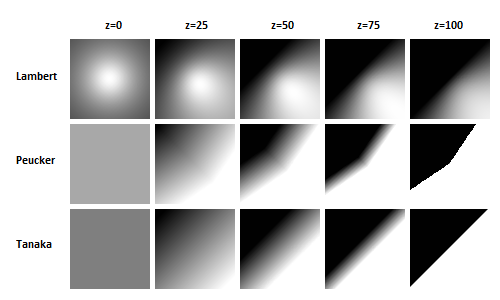 Depending on the artificial shadow length, grey values (0=shaded..255=exposed) are assigned to each cell of the output raster. Tanaka: This method is based on the idea of a terraced model of the terrain which is illuminated by a light source. The calculation of the luminance is based on the ratio of illuminated to shadowed areas. This method gives good results except when the light source is at the zenith. Lambert: With this method the terrain is assumed to be an ideal lambertian reflector. The luminance is proportional to the cosine of the angle beetween the surface normal and the direction vector to the light source. Drawback of this method: Areas exposed to the light source get brighter with increasing slope, but get darker when the zenith angle of the slope's normal increases above the zenith angle of the light source. Peucker: For the standard case (light source in north west) this method is a piecewise linear approximation of the method based on lambertian reflection. It avoids the effect of areas getting darker with increasing slope (parameter sunPosition has no effect in this case). By default, the output grid is constructed according to the structure of the input grid (reference point, cell size, and number of columns and rows). However, a user defined output cell size can be defined (parameter pixelSize). User defined XY-limits (parameter limits) can either refer to the centers (=default) or corners of the outermost pixels (c.f. limit parameter description). The slope values to be used for shading calculation must be estimated from the height values of the grid points. The estimated slope values are located in the center of 4 adjacent grid points. If XY-limits are not specified, then the estimated slope values will be used directly for the shading calculation, and therefore the resulting image is one column and one row smaller than the input grid. If parameters limits and/or pixelSize are specified, a bilinear resampling of the slope values will take place before the shading calculation. Estimating slope values from heights can be avoided if corresponding grid features were derived with Module Grid. normalx/normaly or slope/exposition may be used alternatively as inputs using parameter feature. In this case, the resulting image will be the same size as the input grid if pixelSize is not specified. Specifies the input grid model file(s). Shaded raster map file name. Estimation rule: The current directory and the name (body) of the input file are used as file name basis. Estimation rule: estimated from file extension if not specified. Edge length of one pixel in the resulting raster image. Estimation rule: default value = model grid size. If no user defined limits are specified or -limit is even skipped, the entire xy-extents of the grid model are used. Method to be used for shading the model. Position of the light source illuminating the model. 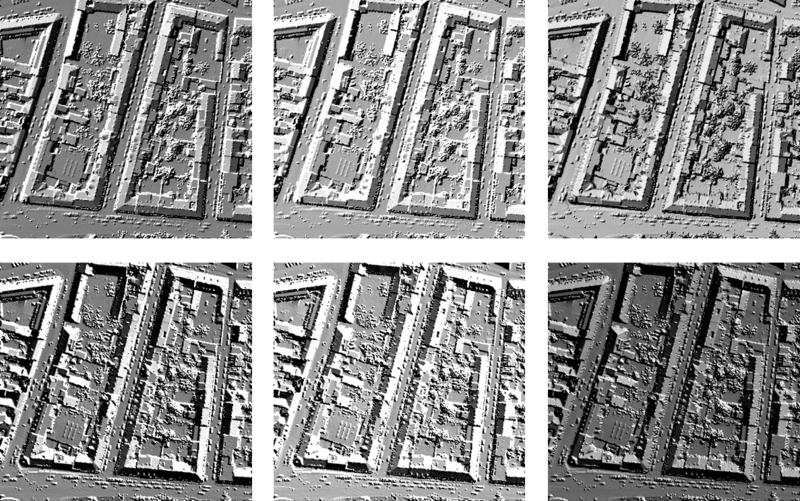 First we will use the following commands to generate a DSM from a subset of the ALS point cloud of strips G111, G112 and G113 using only a minimum set of parameters. opalsImport -inFile G111.las G112.las G113.las -outFile GAll.odm -filter "Region[-2100 338850 -1900 339040]"
Now we can use Module Shade to compute hill shadings from this DSM using the following commands. We specify the input grid, the resulting raster image file, the shading algorithm, and the virtual sun position. Alternately, we may use grid features normalx/normaly or slope/exposition as input.